The team behind the new Shakespeare display at the Victoria and Albert Museum inspire you to inhabit one of Shakespeare’s characters. This year marks the 450th anniversary of the world’s most popular playwright: William Shakespeare, who was born on 23 April 1564. Since then Shakespeare’s plays and poetry have been translated into every major living language, and are still performed more often than those of any other writer. The V&A display Shakespeare: Greatest Living Playwright explores Shakespeare’s works as the inspiration for a multitude of theatrical interpretations through the centuries and across the globe. It begins with the First Folio – the first collected edition of 36 of Shakespeare’s plays (Pericles was not included), often described as the most important work in the English language. Published in 1623, the Folio contains the first known versions of many of the plays. Without it, 18 of the works would be unknown today, including Macbeth, The Tempest, and Twelfth Night. Also on display are a range of objects from the V&A’s extensive collections, including costumes, set designs, and photographs, and a collection of films and interviews that highlight the extraordinary diversity of approaches that Shakespeare’s words and characters inspire actors, directors and designers to create. Using one of the objects shown below as inspiration, write a poem that gives voice to one of Shakespeare’s best-loved characters: Hamlet, Richard III, Titania or Desdemona. You can write in the voice of the character in the play, or as the actor playing the part. These characters have been interpreted onstage many thousands of times before, but in your poem they will live as though for the first time. Like a brilliant stage performance, your poem will give them a new edge, a new air, a new thought or understanding. Vivien Leigh (1913–67) wore this headdress in her role as Titania in the Old Vic’s production of A Midsummer Night’s Dream. A Hollywood star, Leigh was also an accomplished Shakespearean actress, performing roles including Lady Macbeth, Ophelia, Juliet and Cleopatra. • Imagine you are Titania, Queen of the Fairies in A Midsummer Night’s Dream. This is your crown. What is it made of? Is it heavy? What does it feel like to touch? What else are you wearing? • How does it make you feel when you put it on? How does it affect your posture, the way you carry yourself, the way you feel about yourself? • Imagine someone wants to take it from you – how does that make you feel? What does it symbolise, or mean to you? Does it remind you of Oberon? Did you wear it at your coronation? • Imagine you are the actress playing Titania – how does this affect how you feel about the crown? Is it heavy, and uncomfortable to wear? How do you feel about your part, the other actors, the director, and the production? This poster was produced for a touring production of Hamlet starring modernist theatre practitioner and theorist Edward Gordon Craig (1872–1966). By depicting the title character brooding over man’s mortality, the poster references a key moment and theme of the play. The image of a man, contemplating a skull, has become an iconic visual reference often associated with Hamlet, although in fact the depiction was used before Shakespeare’s lifetime. • Read Hamlet Act V, scene I, the ‘gravedigger scene’, in which Hamlet soliloquises (speaks out loud, alone) to a skull, reflecting on life, death, and the futility of existence. • Imagine you are Hamlet, Shakespeare’s most melancholic hero, standing in a graveyard in Elsinore, where two gravediggers are digging the grave for Ophelia, your lost love. How do you feel? What can you see? • You pick up a skull – that of Yorick, jester to old King Hamlet, your father. What does it feel like? Is it cold/warm, light/heavy, wet/dry, clean/muddy? • What does it remind you of? What are your feelings on seeing it, and on learning whose skull it was? • OR imagine you are the actor playing Hamlet. How old are you? What does this part mean to you? How do you feel each night as the play starts, and you step onto the stage in front of the audience? • Famously, David Tennant used a real human skull to play the part in the RSC’s 2008 production. Is the skull you are using real, or fake? Does it unnerve you, or does it make your acting more powerful? Actor-manager Sir Henry Irving (1838–1905) was a celebrity of 19th century theatre. 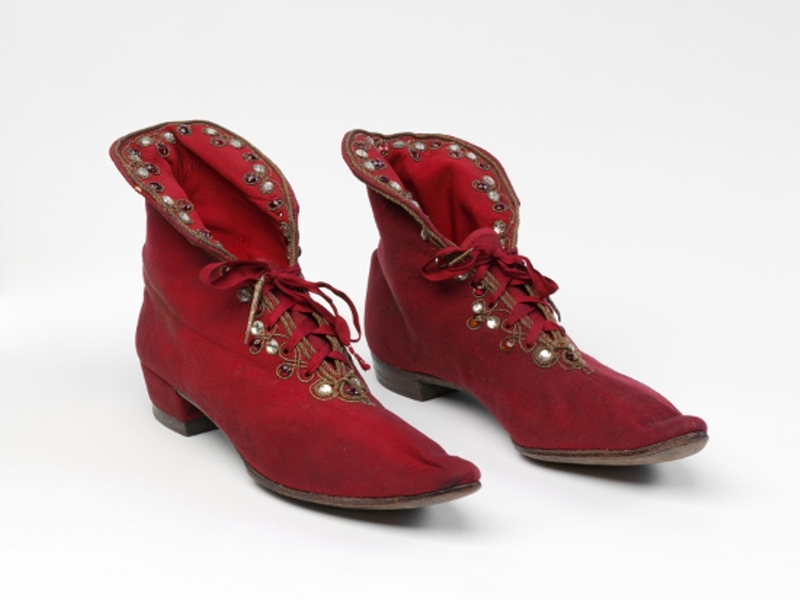 Irving wore these boots with a raised right heel for the title role in Richard III, which helped him to perform the character’s distinctive limp. • In the first speech of Richard III, Richard opens the play single-handedly, and talks to the audience directly about what has happened, his plans for the future, and how he is perceived by the rest of the court. • Imagine you are Richard, Shakespeare’s tyrannical leader. What are your thoughts at the start of the play? How do you feel about yourself and your body? What do you see when you look in the mirror? • How do other people react to you? • Imagine you are the actor playing Richard. How do you physically change yourself with costume, make up and props, and movement, to change your body? • What do you think about your part? In Othello, the title character gives his wife Desdemona a handkerchief embroidered with strawberries as a love token which becomes the catalyst of the tragedy. Ellen Terry (1847–1928) used this handkerchief as Desdemona in Sir Henry Irving’s production at the Lyceum Theatre. Very little of the handkerchief’s beautiful embroidery would have been visible to an audience but Irving was renowned for his attention to detail. • Imagine you are Desdemona, Shakespeare’s tragic heroine. The handkerchief embroidered with strawberries that Othello gave you as a token of your love is a precious possession. What does it look and feel like? • Where do you keep it? What does it mean to you? What would you do if you found it was missing? • Imagine you are the actress playing Desdemona. How do you feel about your character and others in the play? What are you wearing? How do you move? What does the handkerchief mean to your character? What does it symbolise? • What does the handkerchief look and feel like? Who made it? Where is it kept between performances? The winning poems will be published on the V&A and Young Poets Network websites, and will be awarded a collection of other V&A goodies. The challenge is now closed – but you can read the wonderful winners by following the links to the side of the page, and be inspired to write your own poem to submit to one of our Poetry Opportunities! The V&A Shakespeare celebrations take place throughout April and May, with Festival Fortnight, a packed programme of events, running from 21 April – 4 May. The Festival programme includes a range of events including talks, workshops, practical master-classes, music, theatre, film screenings, special activities and themed events for all ages. For more information visit www.vam.ac.uk/page/s/shakespeare/.